The first annual Los Angeles Times Night Market will be a bustling outdoor street-food market that takes over Grand Park for five consecutive nights from May 10 to 14. 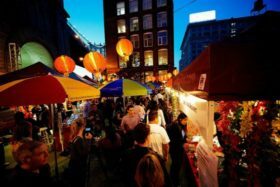 The Night Market will feature 50 diverse and exciting food booths from L.A.’s favorite restaurants, food trucks, and bars.Participating vendors include Chengdu Taste, Ricebar, Salt & Straw, the NoMad Truck and more. Bring an appetite, a sense of adventure towards eclectic food and be prepared to taste some of Jonathan Gold’s loved dishes from Chendgu Taste’s famous Toothpick Lamb to Side Chick’s Hainan Chicken, Guerrilla Tacos‘ legendary tacos to Bludso’s brisket BBQ. The event is free, but you can purchase tickets to The Super Market, which will allow you access to curated food vendors, additional seating areas and food booths, and a lot more entertainment. The price to get into the Super Market is only $10. The event will be held at 210 W Temple St Los Angeles starting at 5 pm the first three days and 3 pm the last two days.